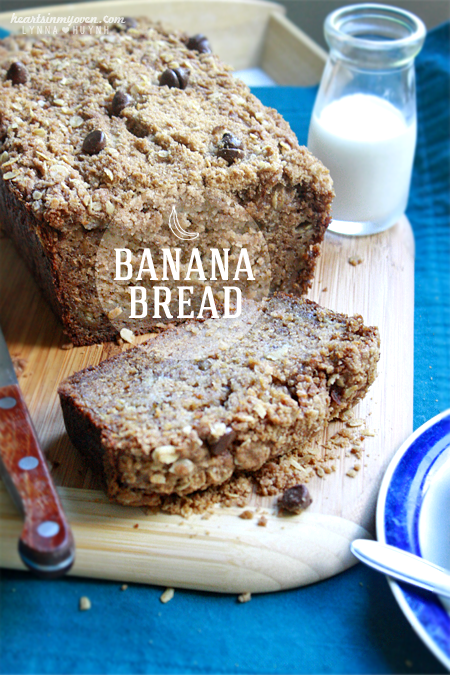 I`ve posted a recipe before on banana bread. A wonderfully, moist, banana bread with swirls of peanut butter inside and topped with a chocolate streusel. Since then, I have baked manyyy banana breads. For some reason, my family never had bananas in the house most of the time. When I was a kid, I enjoyed eating them. But, there was a period around middle to high school, I never ate bananas since no one bought them. College started, so I had a bigger say in what I wanted to eat. This past year, I started buying bananas, but they got ripe too fast. Being an avid baker, of course that meant I had to use them to bake! :) I love how simple they are to bake, since they`re a type of quick bread. They`re also great for gifting! I have given them as little gifts/treats to the adults in my family since they`re usually not too keen on other sweets, like brownies. Plus, aside from my youngest sister, everyone in my family eat bananas! I`ve been testing several recipes and adding things like strawberries and blueberries inside. When I saw My Baking Addiction's post on THE BEST banana bread...I knew I had to try! This time, I kept it simple, without any add-ins, to get that true banana taste. This recipe requires FIVE bananas! I knew it had to be a good one! Let me tell you, it IS one incredibly good banana bread. It`s moist, thick, and full of bananas. 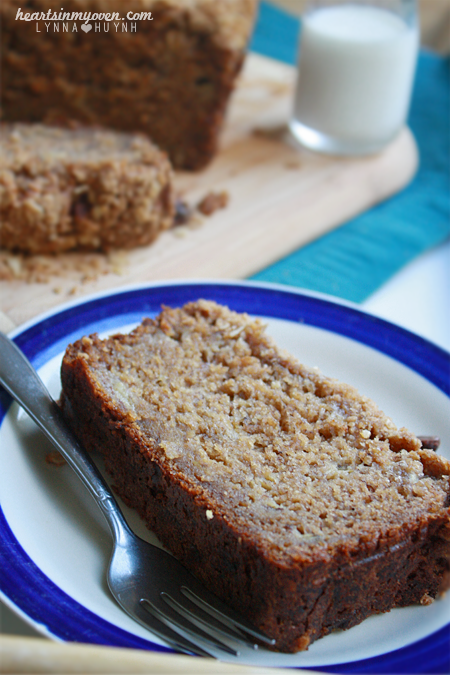 I still can`t say it`s the absolute best, since I feel like I would need to bake a ton more banana breads before deciding, but I loved eating this one! 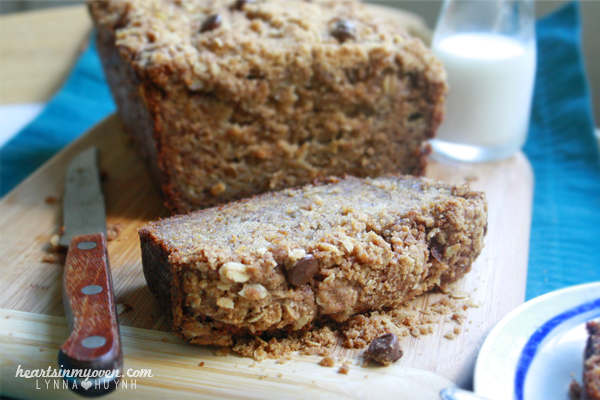 You don`t have to add the chocolate chips on top, but I love the banana + chocolate combo! 1. Preheat oven 350°F. Line a 9x5 inch loaf pan with parchment paper, up the sides/or spray with cooking oil. 2. In a large bowl, whisk together flour, baking soda, salt, and ground cinnamon. 3. In a large bowl, with an electric mixer, beat together the butter and brown sugar until light and fluffy. 4. Beat in the eggs, yogurt, vanilla, and mashed bananas until combined. 5. Using a rubber spatula, fold the dry ingredients (flour, baking soda, etc) into the wet ingredients (butter, sugar, etc) until just combined. 6. Transfer batter into prepared loaf pan. 7. In a medium bowl, combine flour, brown sugar, cinnamon and oats. 8. Using a pastry cutter, or the back of a fork, cut the butter into the mixture until coarse crumbs form. 9. Sprinkle on top of banana mixture. Press slightly down and sprinkle top with chocolate chips. 10. Bake for 60-65 minutes, or until tops are golden and toothpick inserted into the middle comes out clean. 11. Cool for 20 minutes before remove bread from pan to cool completely on a cooling rack. - You can eat the bread warm, just let it cool slightly. - Cover well. You don't need to refrigerate and it will still last several days well.